New Spring Assist Swagger Knife coming from Gerber. Here’s a quick SHOT Show 2013 video. Can’t even tell you how excited I am for these to arrive. These are top notch spring assist knives. Quick video from SHOT show 2013 on the Gerber Propel auto knife. This is one fantastic knife. USA made, fast action, great shape. Gerber has a great gift guide on their website. Topping out their list in the Tactical Gift section is the Remix and they have the Guardian Fixed Blade second. I like both those knives, but I think I would switch the order. I really like the Guardian. If you want to step up from there–consider the LMF Fixed Blade. One of the better fixed blade knives in their lineup. The Gerber 06 Automatic knife is a solid built addition to the 06 line of knives. This USA made knife comes with black machined G10 handles that give amazing grip, this fully auto knife sports a comfortable grip and a pommel that is perfect for emergency egress. We’ve reduced the weight of our best-selling 06 Auto with the addition of G10 handles. 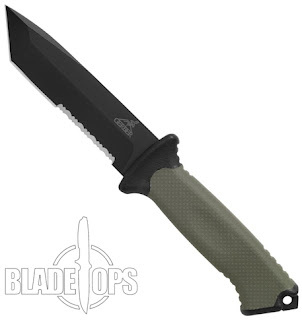 The S30V tanto blade measures in at 3 3/8″ long and has a black oxide coat to give it a tactical feel. At 1/8″, the thickest part of the blade is right on the spine by the handle. The extra strong tanto style blade gives the tip extra strength and makes it great for piercing. The story goes that the original tanto design arose from Samurai warriors. When they broke the tips off their swords, they would resharpen them into a tanto shape. After a while, they realized that the shape gave their sword even more effective piercing power and began to design the Katana with the tanto tip so as to have a sword with maximum piercing power. The handle on the 06 not only has the machined G10 for maximum “grippiness” but also features an oversized push button that makes it easy to fire the blade even if you are wearing tactical gloves. G10 makes for a light knife that is durable and ready for heavy use. The slide safety is found right below the push button and makes for simple one handed use. A red dot shows when the safety is not engaged to let you know the knife is “live”. The handle has fingerguards to give you a more secure grip. Strategically placed jimping and an extra deep finger choil make for an amazingly secure grip. Closed, the knife measures in at nearly 5″. It weighs just 6.3 ounces. This is a great tactical knife for heavy, daily use. If you need a great automatic knife that can keep up with you, get the Gerber 06 auto with G10 handles. Looks like Gerber recently announced their new Propel automatic and assisted opening knives. The Propel Auto comes with a 420HC black oxide finished tanto blade with partial serrations. The Propel Downrange Auto is exactly the same but with an S30V blade. Both of them have G10 handles. The Propel is black G10 and the Propel Downrange is a Desert Sand G10. Rumor has it the auto mechanism is faster than the earlier Gerber Auto knives–which would be fantastic. This knife series is built just a little thinner for more comfortable and discreet carry. They also come with a multi position pocket clip. We are super excited about this new addition and can’t wait to get them in shop. You can check out a few more details on each knife over on our site. This set of articles will compare and contrast each of the different knife series as well as the knives within each series. Let’s start with the Covert automatic knives. The standard size Covert Auto knife has a 3.78″ blade and is 8.7″ fully open. The Mini Covert checks in at 6.5″ overall and has a 2.8″ blade. Both of the Covert knives come with an S30V stainless steel blade finished black. The blade on the Covert is a true bayonet style blade with a combo edge while the blade on the Mini Covert is combo edge also but is more of a clip point style blade. Both blades have mild jimping on the spine. If you put the two knives side by side, the handles are identical in style and shape–the only difference is the size. The Covert does have some very aggresive jimping on the handle right as it curves in and then out for a better grip. The older version did not have this jimping on the handle–I think it is great because it gives you an extra solid grip. The curve in the handle on both knives acts somewhat like a blade guard by helping you keep your hand away from the knife. When I hold the knives, my thumb naturally goes in the upper curve along the spine of the handle and my forefinger rests perpendicular across the lower curve for an easy, comfortable grip that gives me tons of blade control. The action on both knives is fast. Each one has a slide safety on the front of the handle that shows a red dot when the knife is “hot”. The button on both knives are easy to push. The knife is simple to manipulate with or without gloves. Definitely one hander knives if you need them to be. Both knives are proudly made in the USA. Each knife also comes with a removable, tip down pocket clip and the always popular limited lifetime warranty from Gerber. If you are looking for a solid automatic knife that you can carry daily and use regularly, either of the Gerber Covert Automatic knives will serve you well. We just got the Gerber Prodigy Survival Knives in stock today. I must say, I am impressed. For an amazingly inexpensive fixed blade knife, this knife has a lot of robust features. The blade is plenty long to get big jobs done but small enough to carry without too much hassle. The tanto point gives you extra blade strength and durability out in the field when your life may depend on it. And I really like the TacHide handle. It is comfortable to hold–and gives you a bunch of gripping power. This is a fantastic survival knife and the sheath makes it just a little bit better. The MOLLE compatible sheath has a DigiCamo pattern that is US Army approved and has a positive lock system that keeps the blade from falling out in heavy terrain. This is a solid survival knife for under $50.00. Check it out on our website at the link above and get one for your go bag. You will be glad you did.